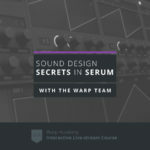 One of the things we find so incredible and powerful about Serum is the ability to create a wavetable from a sound that’s already been heavily processed. One of the reasons audio sampling has been used a lot by Drum and Bass and Neurohop producers is because most synths alone didn’t have enough built in processing. This necessitates a LOT of post processing using audio effects, which can be an incredibly frustrating, and time consuming, processor heavy resampling processes.